It’s game time! Shop for your favorite digital content such as music, apps, games, among others from Spotify, Steam, Google Play, iTunes Apple Store, Netflix, NBA League Pass, etc. 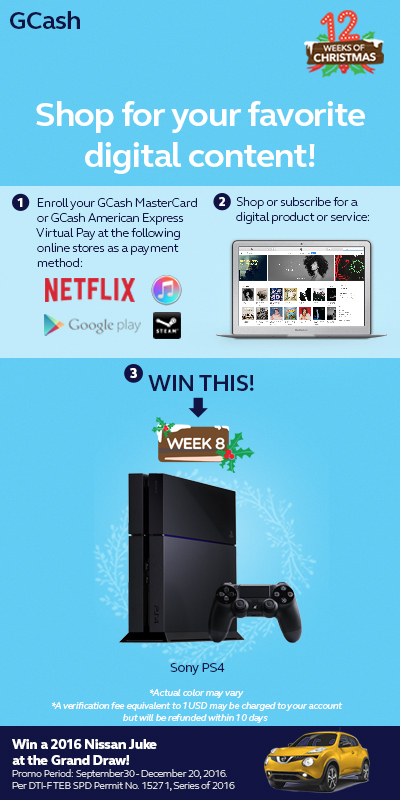 using your GCash MasterCard or GCash American Express Virtual Pay from November 18 to 24 and you may just be the lucky winner of a Sony PlayStation 4 gaming console. More so, you also qualify for the grand draw on December 21 where a brand new Nissan Juke is up for grabs. With GCash MasterCard and GCash American Express Virtual Pay, you can easily buy from major online shopping sites in the country and abroad without the need for a credit card as they are linked to your mobile wallet. You can put funds in your GCash wallet for free at over 10,000 GCash accredited partner outlets nationwide. GCash MasterCard is a debit card which allows you to securely and conveniently transact at any of over 33 million MasterCard partner establishments worldwide without extra charges. Check out www.globe.com.ph/gcash-mastercard to see where you can avail of GCash MasterCard for just P150. GCash American Express Virtual Pay provides shoppers a personalized US address in partnership with a reliable shipping company, My Shopping Box, to enable smooth and worry-free delivery of goods in the country. Getting the GCash American Express Virtual Pay is fast, easy, and FREE. Simply register your GCash wallet and email address online at https://mgcash.globe.com.ph/gcashamex . Once your account is validated, you will immediately receive your Virtual Pay account details, your personalized US shipping address, and other pertinent information via email. Every week leading to Christmas, we will be giving out gifts to our GCash customers as they accomplish certain GCash tasks. To qualify for the November 18 – November 24 promo, a GCash customer must successfully purchase digital content using GCash MasterCard or GCash American Express Virtual Pay to earn one (1) raffle entry. This week’s raffle draw is on November 25.